I know this topic is not for very light readers but I have faith in those who read my blog they will have the patience to read till the end to know what I am talking about. Ever since I have become aware of the good inside me and am working on it. I got confused with this word, read “n” number of books , listen to wisdom filled people , ask questions or get answers one thing was common all spoke or said about something called “conciousness” like “lift your conciousness” or “free or conciousness” etc etc . Now as per my knowledge consciousness was to be aware of something even a dictionary would give you the same meaning i.e to be aware of something or someone example “I am conscious about him looking at me ” , how could you just lift that up or free it from something??? It took me many years to honestly simplify it thus sharing it with you. Consciousness in a very regular perspective would mean nothing, but on the spiritual context would have multi fold meanings. Yes even there it would mean to be aware of something or someone but spiritually you’d understand it only when you get the answers to questions of “who someone?”. To answer this we need a little introspection into our thinking or how we create thoughts. Please take a look at the above picture. Though it is self explanatory I would still elaborate it a bit. 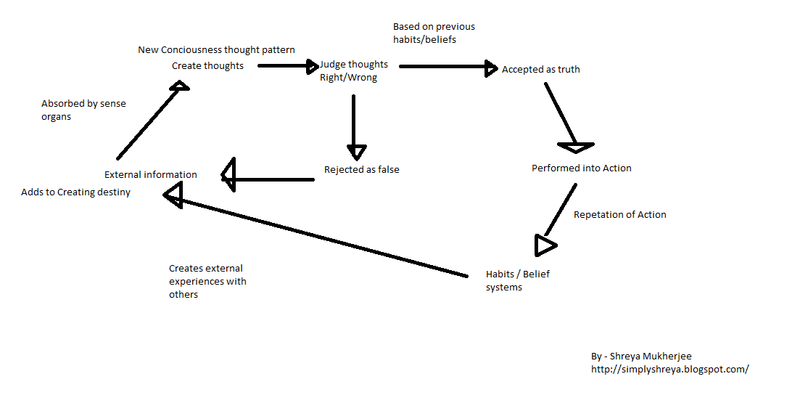 The above diagram shows how a consciousness is created. And it is interesting to know that every second of the day we are all creating and growing in our consciousness because our mind from the time we were born has been only adding information and depositing them somewhere deep down so every second of the day we are only adding more to our consciousness. Simply view a library in which books of latest releases and prime importance/demand are kept in the front row while the one’s least used are always stored at the end or deep somewhere. Just that our mind is much sharper than any librarian if you really want to retrieve a file you can given the required time and self belief. a) Going by that we have a Consciousness at this very second (the next second we can have a different consciousness) which inspires us to look at a certain way at something. Step 1 NEW CONSCIOUSNESS that creates thoughts inside us. b) Next comes a sense of JUDGEMENT to know if the thought or idea or view created is right or wrong. Who decides right or wrong ? again the same consciousness based on past experiences , beliefs, knowledge etc. c) Thus comes the next part i.e decision is taken either ACCEPTED OR REJECTED by us. d) Once ACCEPTED as truth if will be brought into action sooner or later. Example- you created a thought XYZ is a liar – accepted as truth by your experience on something – stored in mind will be used as soon as you interact with XYZ later. f) On the contrary if brought into action and repeated action it becomes your HABIT/BELIEF SYSTEM. Lets say once you get up late in the morning and justify that and then do it several times more, it becomes your habit. This creates an experience which interferes with experiences with others or simply involves others consciousness too. g) Once a new experience is added , it is simply that which we call as “DESTINY”. This Destiny becomes another added information to your EXTERNAL INFORMATION. Thus repeating the same loop after being absorbed by our senses again. Now to prove this you can do an added experiment, which I have been successful with (like I said research is important). In this you will have to intentionally inhibit a consciousness into yourself. After which I will ask you to just take a look at who so ever is around you (person) and quickly catch your 1st thought that arises about that person. In this experiment I’d like to prove that the consciousness that you intentionally feed into your mind has a direct relation to the thoughts that is created about different things. Which means you are more aware about the inhibited consciousness. So ready? Lets do it. 1. For 5 minutes think about colours varied colors , deep and down try feel it. Remember every information you know about it and see them vividly in your mind try be absorbed in it. Then Relax again. 2. Now slowly see any person around you. 3. Remember the first information or thought that hits your mind and note that. You can try the 5 minutes thinking about different things like religion hindu , muslim , sikh , christian etc or you can try think about good or bad virtues etc. The first thing has to be something related to what you deeply thought about in those 5 minutes. Like you thought about colors you would end up thinking red lips, black hair, blue dress etc just vaguely related to colors. The same goes for consciousness that adds with religions or good and bad virtues etc. The idea is to show that such deep thoughts come on the floor of mind when you pay attention to them and they sit on your mind while you are interacting with other people. This eventually travels to other people and they presume you accordingly thus creating your destiny with those people. In fact you can create personality even for non living things depending on your consciousness. Example cars , coins, mountains, rivers etc that is why you’d find some languages referring mountain as male, rivers as females and so on because at that time when those language were created their consciousness created a difference between man and woman thus their work showed its reflection. Interesting isn't it ? So this answers our first question aware of "who someone"?? aware of our own thoughts or our mind. But how to be aware of something we cannot even see ? Not easy i agree so there is an alternate route. Since it is a loop we can always go a step back and see what else can be changed here it is the external information we feed it. World wide web has greatly influenced our lives we cannot deny it but we all know that all information available in it is not useful, similarly everything we hear , see or even feel might not be true so absorbing information and good information per say becomes vital. This is the only way to start breaking the chain that creates your Destiny. It definitely does not happen in a day but a gradual look at information from various sources would slowly give you a feeling of what is good and not so good for you. Every time you choose something as truth it is verified and brought into action. So choosing and filtering information lifts your consciousness. Everything we are today this very scene that you are seeing and feeling is the result of deep rooted thoughts created in your consciousness. You choose what to feel the very next moment. Thus creating your Consciousness. Finally your Consciousness is nothing more than what you choose to be. And that should always look up , up and up. You can always comment and speak your mind. A wonderfully thoughtful and thought-provoking post once again. The exercise you give should prove most useful and revealing for many. Your words remind me that most systems that have existed to address the larger questions of awareness and existence have at their core 3 stages: the first, the initial realization that illusion or misperception can and does exist- that not only our senses, but our mind itself may err; that not only the world and others around us are in a constant state of change, but we ourselves are also, as well; and yet the "I" that exists eternally in the present can never directly observe this change as it takes place, but only observe the differences between the past and the present, and attempt to construct a guess about the future.. becoming aware or conscious of this, is the first step. The second is the journey to become conscious of that which is both beyond, and yet underlies, that which can be observed or described... just as ice, steam, snow, a lake, or an ocean are all manifestations of water, and yet none of these can contain the complete experience of "water"- this is where it is discovered that no mirror can suffice, that any step taken "outside" is to lose the path completely... the second step is to move without moving, as it were- a very rare achievement, to be sure! @JaiMaaDurga .. Nope you didn't write any tangled words they simply meant what you wanted to explain for anyone interested would surely enjoy your write up. And so wonderfully hae you explained all 3 steps the realization, the movement and the return perfect to understand that it is such a jolt between all worlds. May be that is why those who are able to do so are called the awakened one's. But over the time what i have realized is that for a consciousness/awareness to stay you have to merely stick to a certain identity and confirm it slowly and steadily with experiment or experiences. We all do that but we do it unknowingly. For example every time we say i like something or i dislike something you are feeding something to your awareness. Which is why when you experiment to find out which virtues are good and not so good for you ... you can easily alter your consciousness... but this needs strong confirmaion which will only happen with experiences. It helps being strongly footed on ground bz it is a very slow process. I guess that is why people say you need a " Guru " who'd be able o put things in right perspective in front of you. :) Thanks for your comment always welcome to put up anything here. Again one more soul searching article Shreya! Amazing!! I do agree Shreya dear. There needs to be a conscious effort to feed the right thoughts into our mind. Again, to control our thoughts, we must make choices. If our heart is angry, self righteous, bitter or resentful, our thoughts will never be right. On the other hand if we choose to think and meditate only on what is good, just, pure and virtuous, our thoughts automatically will be pure. But you know what? Choosing to control our thoughts many times causes an extreme struggle within. One must fight this battle moment by moment. Right now, I am in that stage. I am struggling not to feed negative thoughts about one particular person. Believe me, it is such an effort not to dwell on hurts. Mind keeps drifting back to them. Just want to tell you something. I am not an intellectual person shreya. but your articles really tickle my brains. tickly my brains. Thank you. I do agree with you Shreya dear. There needs to be a conscious effort to feed the right thoughts into our mind. Again, to control our thoughts, we must make choices. If our heart is angry, self righteous, bitter or resentful, our thoughts will never be right. On the other hand if we choose to think and meditate only on what is good, just, pure and virtuous, our thoughts automatically will be pure. Trust me Nirmala the same happens with me and I can completely relate to what you are saying here , the minds wanders back to old topics and keeps hunting for reasons where someone else could have done something to make me feel better. But over the time i have understood that honestly nobody can make you feel better if you do not want it, because there are times when we are in our happiest of moods and even worst of criticism doesn't hurt us then and there are times when we can in our saddest of moods and even healing words seem bitter. It is all in our mind , yes bit difficult lot struggling but that is a fact. And Thank you so much for admiring me :) i admire you too for coming out so opening about your feelings everytime i really love that about you. I guess all of us are in a journey just slowly and steadily trying to find our inner peace. That's admirable isn't it :). Thank you so much dear for posting. INTERESTING TO READ THAT CONSCIOUSNESS CAN BE MODIFIED, UPLIFTED BY FEEDING THE JUDGED INFORMATION. LET ME TRY AND RESPOND IN A BETTER MANNER. Conciousness is the result of our thoughts -judgment - action all in cycle and yes it can be modified that is the beauty of nature i guess , it returns us back to the same stream of God's own purity and love. Thus yes we can always mold it and get closer to our original source. I'll wait for your deeper analysis. Eagerly waiting. RECENTLY, I HAVE TREAD THE PATH OF PURITY AND PERFECTION IN LIFE. PURITY, I MEAN, PURITY OF THOUGHTS AT MENTAL LEVEL ... AS THOUGHTS LEAD TO ACTION. PURE THOUGHTS, I MEAN, THAT WHICH ARE NOT - ‘KAMA’, KRODHA’, ‘LOBHA’ . ‘MOHA’ ‘MADHA’ AND ‘MATSARA’ AND OTHER VICIOUS THOUGHTS. I FEEL ... ONCE I AM PURE, I CAN LINK MYSELF TO GOD. I CAN PRAY, FEEL GODLINESS, ONENESS WITH GOD AND THEREON ENJOY SUPREME BLISS. KEEPING THIS IN MIND, I HAVE BEEN READING ARTICLES ON SPIRITUALISM, SELF-DEVELOPMENT, PHILOSOPHY, ETC. I HAD VAGUE THOUGHTS. WHEN I READ YOUR ARTICLE, IT WAS REFLECTION OF MY VAGUE THOUGHTS. I FELT YOU HAVE WRITTEN WHAT I WAS THINKING. AFTER READING, THOUGHTS ARE MORE STREAMLINED AND SYSTEMATISED. THANK YOU VERY MUCH... I BELIVE IN REFINING MYSELF BY TAKING WISDOM OF OUR ELDERS AND INTELLECTUALS. EVERYTHING PERCEIVED BY SENSE ORGONS ARE RECOGNISED AS GOOD, ENJOYABLE, BAD, ETC., BY OUR MIND AND OUR BODY ACTS ACCORDINGLY. GOOD, BAD... JUDGEMENT IS MADE KEEPING IN VIEW THE PAST EXPERIENCE/RECORDINGS OF MIND. EG., LISTENING TO A BOLLYWOOD SONG – I ENJOYED BEFORE.... SO WHEN I LISTEN AGAIN... MY MIND ORDERS THE EAR TO LISTEN AND MIND WILL ENJOY. ON REPEAT OF SUCH INSTANCES, A NOTION IS CREATED IN THE SUBCONSCIOUS MIND THAT BOLLYWOOD SONGS ARE ENJOYABLE. SUBSEQUENTY, I YEARNED FOR BOLLYWOOD SONGS FOR ENJOYMENT. I WAITED GOING TO OFFICE TILL A SONG IS FINISHED. ONE THING GOOD FOR ME ... MAY BE BAD FOR ANOTHER. NOW, AFTER BEING FRUSTRATED AND EMPTINESS OF CERTAIN THINGS, I FELT, I SHOULD COME OUT OF THEM. AS A MATTER OF HABIT (SUBCONSCIOUS LEVEL), WHEN A PROVOCATION, SAY, IN THE PRESENT EXAMPLE....WHEN I LOOK AT THE POSTER OF A BOLLYWOOD BLOCKBUSTER ON A ROADSIDE HOARDING.... I FEEL LIKE BUYING A CD. AT THAT POINT OF TIME, CONSCIOUSLY I AM REMINDING MYSELF OF MY GOAL... PURITY AND PERFECTION. IN THE WATCHFUL AND ALERT STATE OF MIND.. IT WAS POSSIBLE. WHEN I AM NATURAL... THAT IS, NOT IN THE WATCHFUL STATE OF MIND, STILL MIND ENJOYED THE BOLLYWOOD SONG. I WILL KEEP TRYING TO IMPROVE.... THANKS AGAIN ... FOR A NICE ARTICLE. I am so happy Sathya ji that my article has helped you even if tiny bit. :) though it is all your effort that you are able to maintain the purity which is already inside you. Actually every person is born pure and perfect like a little child we just let ourselves get a little polluted over the time now just need to use a refinery system which will clean one thing at a time. But till that time we must remember we are already pure and what we did was not sin because we were not even aware of ourselves and our mind. At times yes there is frustration but dont worry we make mistakes in everything we will make in this too but forgive yourself let go and start fresh again everytime. It is ok to fall then get up dust yourself and then run again. Just in case you are hurt over something take a break it helps , heal yourself nefore you start the journey again. Do not listen to anyone because too much information also increases the self expectation .... thus enjoy bollywood for sometime no harm at all just do not get addicted. I am also on the journey Sathya ji. I am no preacher just sharing my experiences. Thanks for liking all this.